My passion for birds didn’t show itself again until college and even then it wasn’t clear to me. One of my professor, Noah Perlut, asked if I wanted to go to Vermont for the summer to study songbirds. Spending every day outside conducting research sounded like a great experience and I did not hesitate to say yes. I spent the summer in Shelburne, Vermont studying Boblinks and Savannah Sparrows. The days were spent nest searching, banding birds, and taking measurements on chicks and adults. Sarah and barred owl, Grinnell. Glen Helen Raptor Center in Yellow Springs Ohio. After my summer in Vermont, my love of birds flourished. I began to notice birds much more frequently than ever before. Their songs illuminate my days and seeing a flash of color now sends me looking for more. 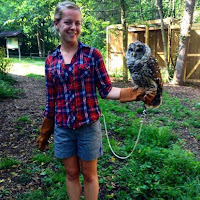 Since that eye opening summer, I’ve done more field work and have worked at a raptor center in Yellow Springs, Ohio. My passion for birds followed me here to the Port Townsend Marine Science Center (PTMSC). While you may not think that there is a whole lot about birds going on at a marine science center, here in Port Townsend, there is! We have a great class that we teach to students called Birds of the Shore and Sea. In this class the students take a closer look at bird specimens observing specific species feet and beaks. They make educated guesses about what these birds might eat and where they live. The students also get a chance to go outside and participate in bird watching by the sea. My favorite part of this class is playing a recording of what a Bald Eagle sounds like and seeing the students’ reactions. The Bald Eagle might not sound as regal as it looks. PTMSC also partners with the Seattle Audubon Society. We conduct Puget Sound Seabird Surveys once a month. The survey takes place at Point Wilson and a dedicated group of volunteers survey the seabirds for a half hour no matter what the weather has in store. Many different bird species can be seen right around the Marine Science Center. As I am sitting here writing this I just saw a juvenile Bald Eagle soar by! The most important thing I have learned is that bird watching is a great hobby, one that you can do basically anywhere. Whether you are observing songbirds that come to a bird feeder in your backyard or raptors you spot soaring high above the mountains out on a hike, birds hold a very special place in my heart. I hope to continue to learn about them throughout my life and share my passion with others. Keep your eyes out for Sarah’s newest project called Birding from the Pier. Once a week she will be posting about a different bird she sees from the pier and a fun fact or two about it on our Instagram account https://www.instagram.com/ptmarinescictr/ and Facebook page https://www.facebook.com/PortTownsendMarineScienceCenter/.